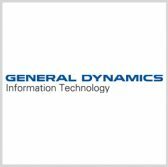 General Dynamics‘ information technology business has received a potential $29.3 million contract to continue to help the Defense Health Agency manage information technology applications of the Military Health System. The Defense Department said Friday the bridge extends current support and service General Dynamics provides to DHA health IT applications as the agency transitions to a new IT platform. The base period of performance will run from Nov. 04, 2017, to Sept. 30, 2018, followed by a six-month option worth $10.4 million. The contract extension was awarded through the General Services Administration’s IT Schedule 70 vehicle.